A continuous, constant, and known rate of demand. A constant and known replenishment cycle or lead time. A constant purchase price that is independent of the order quantity or time. A constant transportation cost that is independent of the order quantity or time. The satisfaction of all demand (no stockouts are permitted). Only one item in inventory, or at least no interaction among items. No limit on capital availability. Maximize $ demand filled from a given investment. Set SS based on specified time supply. Demand during lead time is larger than order size. If ordered only when replenishment comes, inventory is depleted. Pink line when backorders, black when demand is lost. 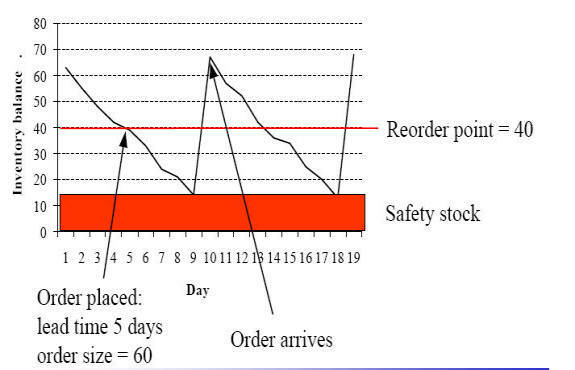 Examples: KanBan inventory in PSG or long lead-time processes, like replenishments from China. When lead-time is 5 days, and expected demand is 6 pcs/day, we order up to 60 + 5*6 = 90. As balance is 48, we order 42 pcs. However, if review is periodic, then the inventory can be more or less below R, so S would be S = Q + (R-inventory). Policy Q,T is interesting. If demand during review T > Q, this policy does not really work. Unless we decide that it is still Q that is ordered but we can order or more times Q (n*Q). In practice, Q could be some physical logistics limit, like full truckload or a full pallet. In practice, S could be some periodic system, like shipping schedule or production cycle. It calculates the probability of a stockout during replenishment lead time, not customer service level measured as fill-rate. They are not the same thing. What if delivery time is not certain but a variable, too? The formula applies only for normally distributed demand, not other demand distributions. How to incorporate demand forecasts? If the LT distribution is binomial, then the joint distribution can be created manually. Normal distribution may sometimes be a reasonable assumption due to central limit theorem. 2< 0,5*X), which still gives 2,275% negative values for demand. Skewed distributions are likewise found in practice. Then incorrect normality assumption underestimates safety stock requirements. There are statistical tests for testing distributions. However, it can prove difficult to find analytical formulas for other distributions. One can always use empirical data and simulate its distribution and base decision on that distribution. Now that we are talking about independent inventory management, this theorem gives a handy way to estimate consolidation benefits for safety stock. Likewise, it enables data conversions: if we have weekly standard deviation and lead time is two weeks, the theorem above can be used to calculate two-week standard deviation. The stockout magnitude must be weighted with its probability. In continuous distributions, this is achieved by a loss function (Vollman calls it service function). It is tabulated in Vollman and approximation formulas for spreadsheets do exist. stock (6*5-0,34) which would become ROP = 29,66. Forecast quality is measured with mean absolute deviation (MAD). Provided, of course, that your forecast error is ~ N.